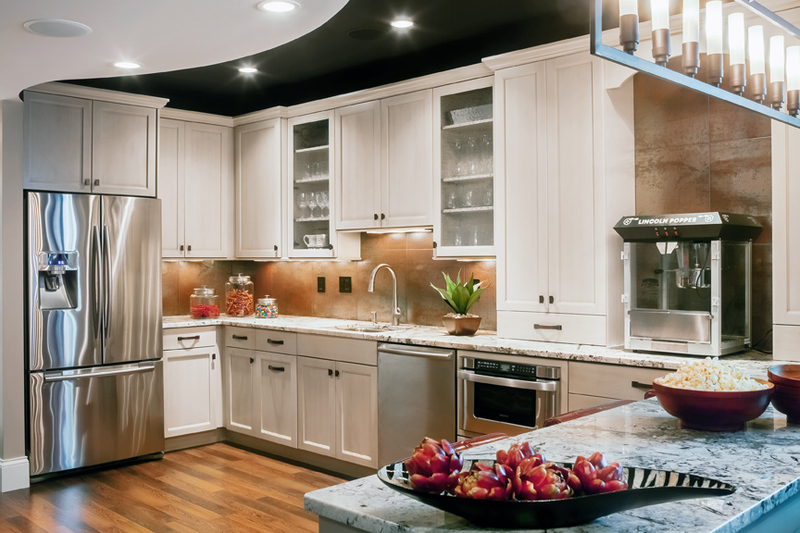 After working together on the upper levels of their home, a young Des Peres family had found their collaboration with Ellen Wortham, ASID, of JE Design Group so successful that when it came time to finish the basement, she was their first call. 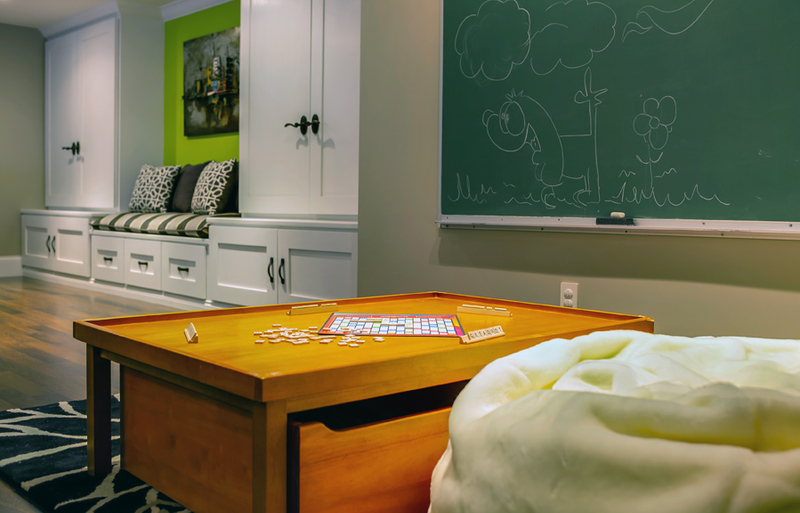 The couple wanted the lower level to accommodate a play room for their three young daughters, storage for a wine collection, a full kitchen for entertaining, a game area and a home theater—a tall order for a space that’s just over 1,000 square feet. “Their wish list was within reason, but it was a lot to fit in that space,” agrees Wortham. Her solution was an open floor plan—a departure from the defined rooms upstairs—that allowed one section to flow into another, forcing “a lot of the areas to be dual-function,” she says. 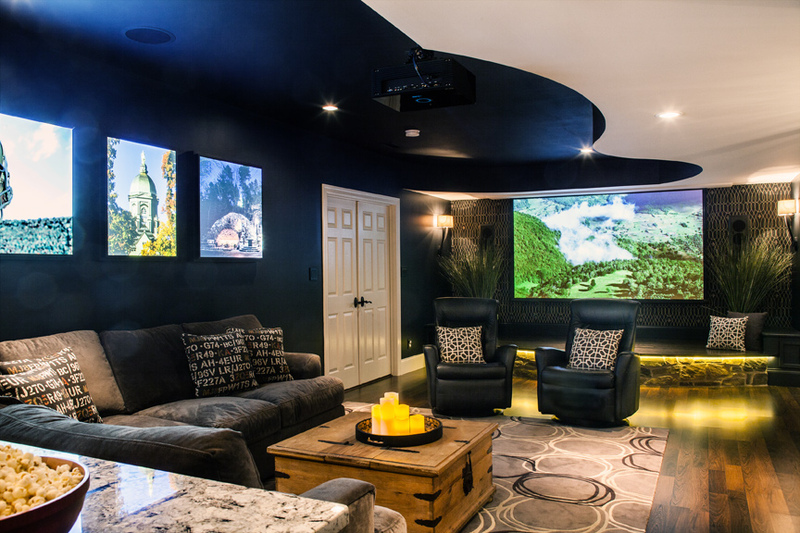 One end of the room, for example, houses both a stage for little girls’ dance performances and a drop-down projection screen for the home theater. The kitchen’s peninsula provides buffet space for parties and doubles as a surface for art projects. “People are afraid of dark ceilings, but that black ceiling is like an infinity—it disappears,”Wortham adds. But lighter walls, white cabinetry in the kitchen and other more traditional touches keep the industrial elements from being too hard-edged. 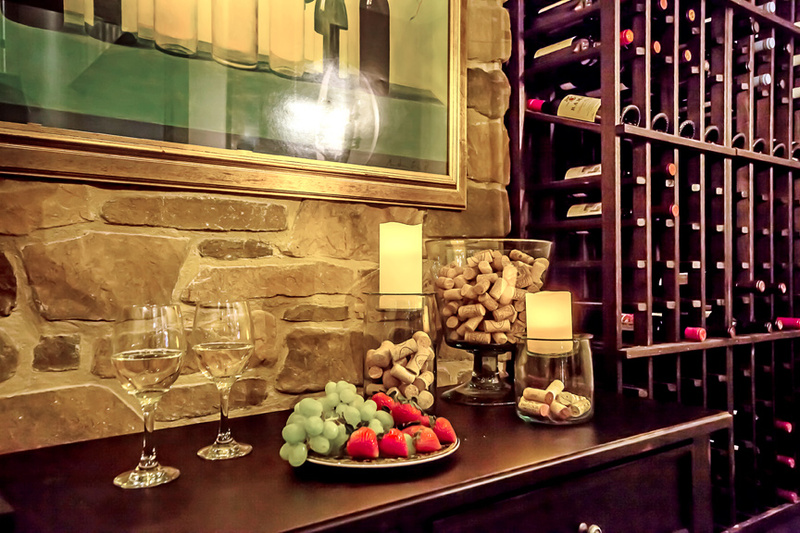 The warm cedar of the wine room contrasts with the corrugated metal over the game counter, while the bright apple green accent wall at one end balances the dark-hued, formal wallpaper at the other. That combination of finishes makes the lower level “every bit as much a kids space as it is an adult space,” Wortham explains.